easyJet selected Croatia for the destination of the year! For the first time in history, this company’s magazine is devoted to only one country – Croatia. British airline easyJet announced Croatia as the destination of the year, which was additionally confirmed by the printing of the July issue of the Inflight magazine, which was for the first time dedicated to one country – Croatia. 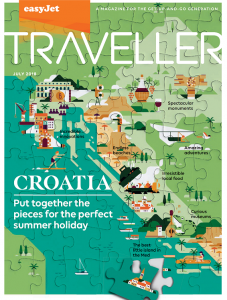 This is a publication intended for users of their services and will contribute to the further promotion of Croatian destinations, since the magazine has a monthly base of more than 6 million passengers. “Choosing Croatia as a destination of the year by one of the key European air carriers for us is a great success, but also a confirmation that we are making important and strategically important changes in this important transport segment. The key goals we have defined include positioning Croatia as an attractive all-year tourist destination, which is also very well connected with traffic, especially in the context of aviolines that are extremely important for boosting tourist traffic in the pre and post periods. With this aim, this year, for the first time, this year we carried out more significant cooperation with air carriers and travel organizers from abroad, “said Director of the Croatian Tourist Board Kristjan Staničić, adding that Croatian tourism can boast of more than 70 new regular lines introduced this year. easyJet has chosen Croatia as a destination where traffic and interest rates are increasing, making our country one of the key destinations of this airline, which travels more than a million passengers to Croatian destinations during the summer months. Only this year we have 49 active lines connecting our destinations such as Dubrovnik, Split, Pula and Zadar with many key European cities such as London, Berlin, Milan, Paris, Basel, Bristol and others. The airline easyJet annually carries more than 82 million passengers, of which about 13 million business passengers. The fleet counts nearly 300 aircraft flying to a total of 980 routes, or 156 airports in 33 countries worldwide.